Xenia Cord’s quilt “So long it’s “bean” good to know you” depicts a fellow quilter’s disdain for the once popular Beanie Babies. How big was the Beanie Baby craze? Back in 1995 it was the first Internet sensation. People couldn’t get enough of them adding to their collections as fast as Ty Inc. could manufacture them. People collected them not only because they liked them but as an investment as well. As soon as a Beanie Baby was retired their value supposedly went up; to the delight of their collectors. McDonald’s was never one to let a great marketing ploy go unexploited, so they started adding Teenie Beanie Babies to their Happy Meals in 1997. The promotion was wildly successful with 100 million Teenie Beanie Babies gone in two weeks. You may have remembered seeing cars lined up at the McDonald’s drive-throughs where the driver would go receive their Happy Meal, take out the toy, throw the meal in the trash receptacle and get back in line. It was CRAZY! Now, as so often is the case, for every yin there is a yang; the people who despised the Beanie Babies. They might not have been very vocal, fearing they might be clobbered if the word got out, but they were out there all the same. They could be considered kindred spirits with “The Sun Sets on Sunbonnet Sue” clan who made quilts depicting various ways of ridding the world of Sue. 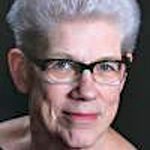 Recently, at the Quilters Hall of Fame celebration, this year’s inductee Xenia Cord, at a walk-thru of her quilts, described to us about one of her quilter friend’s antagonism toward the Beanie Babies. Her friend was appalled that they were even showing up in antique shops where they certainly didn’t belong! So, in 2000 while the craze was still going strong, Xenia collected Teenie Beanie Babies and incorporated them into a quilt entitled “So long it’s “Bean” good to know you.” Each block depicts a Tennie Beanie Baby meeting their demise: The pelican is caught in a lobster trap, the koala is being smothered by factory pollution, the lobster is caught in a fisherman’s net, the hippo will overdose on sugary treats, the cat used up all nine lives and is now road kill, the Marlboro Monkey will die of lung cancer, the giraffe is being strangled by his neck tie, the caterpillar is lunch for the crow, the Doberman is choking on a burglar’s finger (a salute to an urban legend! ), the parachuting pup has a malfunctioning chute, the penguin is frozen in ice and the elephant is terrified of three small mice. 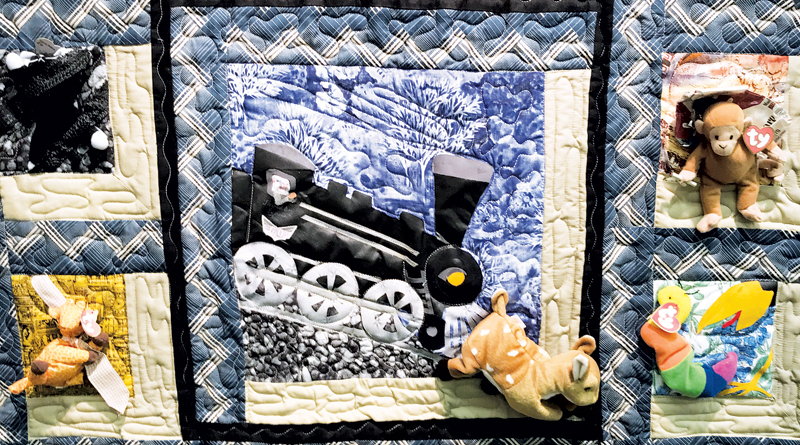 The center of the quilt depicts Xenia’s quilting friend operating the locomotive ready to sweep the deer off the rails. This quilt was auctioned to raise funds for the American Quilt Study Guild. It was noted that no beanies were killed in the making of this quilt. Kudos to Xenia for taking one quilter’s frustration and turning it into a creative quilt!